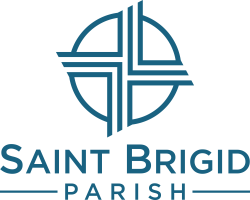 1940 (March) - Saint Brigid Parish was founded by Monsignor J.A.C. Van Veggel. It was dedicated four months later in July. 1948 (December) - The present church, which also incorporated Saint Brigid Academy, was dedicated. The academy closed down in 1971 leaving behind parishioners who still can remember their time here as students. 1980 - The original church was torn down when the current Saint Brigid parish hall was built. 1997 - We had a major renovation project including repositioning the main and side altars, increasing the size and seating capacity of the side transepts, and retrofitting for earthquake safety. 2007 - A new rectory (residence of the priests) was built next to the parish hall allowing the former rectory to become our present-day ministry center. The ministry center houses many parish offices, meetings rooms, social areas and the spacious kitchen- a room that gets tons of use in our functions!